Even if you have a great marriage, we will all experience moments of frustration with our husbands from time to time. Well, one key to resolving those frustrations (and avoiding them in the future) is to understand the cause. In my experience, the cause is typically “unmet expectations”. We consciously or even subconsciously expect our husbands to act in a certain way, and when they don’t, we get really frustrated! So, here’s a nugget of wisdom that may be the remedy for you and for me. Clearly communicate your expectations to your husband! Duh! I know this sounds too simple, but honestly, we are often at fault for holding expectations but failing to clearly reveal those expectations to our men. We act like our husbands are mind-readers and should “just know”. News flash: Most men don’t “just know”. They don’t think like women and they don’t know what you expect and desire from them. In fact, when we fail to communicate what we want, we’re not really being honest with them. 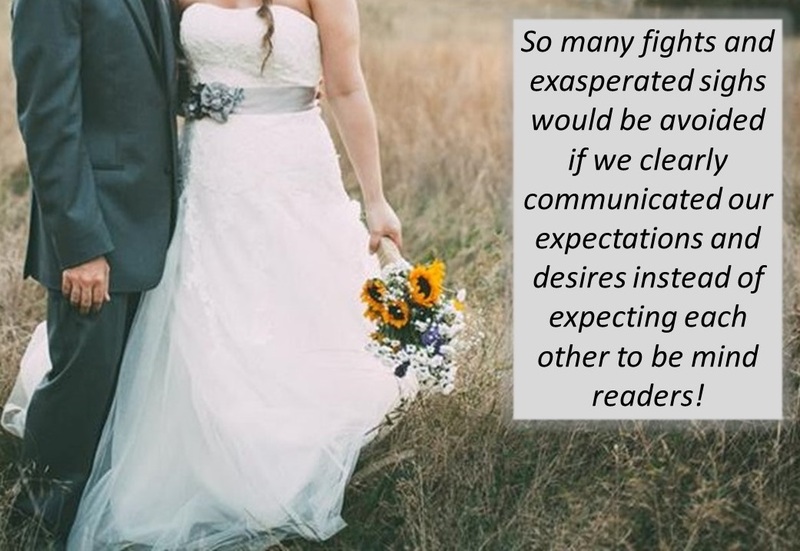 Let’s bless our husbands by being honest about our expectations. Proverbs 24:26 says “An honest answer is like a kiss on the lips“!! Start to clearly communicate your expectations to your man. Now, your husband may disagree with your expectations, and that’s okay. That’s an opportunity for the two of you to sit down and discuss your respective opinions and work toward a compromise. But at least you’ll be on the same page and understand each other’s expectations! ← Try God’s upside-down plan for your marriage!